Great audio, limited DVD. It seems ironic in age when too many talking heads and cut away edits detract from the subject at hand, that the decidedly old school ‘Grateful Dead at the Hollywood Festival’ could have done with a decent voice over. As it is, the mix of grainy, acid drenched band and crowd footage with black and white stills and accompanying audio tracks just about gives you a coherent feel for one of the ground breaking festivals in the North West of England back in 1970. And it is the counter culture of the North West England that Ozit has made its name documenting both the Bickershaw and Deeply Vale Festivals. The focus is often not just on the music but the events themselves and the people who were there. No surprise then that there’s a distinctly lo-fi feel to the DVD, but nonetheless enough footage (5 Dead tracks on the DVD and 12 on the audio) and plenty of photos to interest anyone who was there. 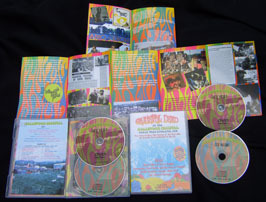 There are several bursts of The Dead’s famed jamming on the DVD and some occasional visual clips of Garcia, Weir and Pigpen doing their stuff. Amongst the stop-start sequences the Garcia/Weir axis rings out loud and clear on ‘Dark Star’. The Free segment features Paul Kossoff in silhouette while the Family footage is clearer with a manic Roger Chapman stalking the stage menacingly before he appears to attempt to fly! For the most part watching the juxtaposition of live footage and stills just about does the job of transporting you back to an era past, but given most of the footage is the result of befuddled efforts of spiked roadies and the like, the sense of ‘being there’ is something perhaps only the folks who were there could relate to. The Screaming Lord Such section appears to be a manic costume ball with Such apparently chucking buckets of something in the direction of the crowd while another figure in a white tutu or possibly a wedding dress (perhaps Keith Moon) adds to the mayhem. The first disc is loving topped and tailed by the incongruous sight of a bunch of Hare Krishna devotees chanting in front of the fondly, or long forgotten (depending on your view) Radio Geronimo banner. What the DVD cries out for is a voice over, if only to add to the sense of context alluded to on the well researched booklet, which features some great photos and quotes. The second audio disc is much much better with The Grateful Dead captured at their languid best, especially so on the 22 minute workout of ‘Turn On Your Lovelight’. There’s also one of Robert Hunter’s first songs ‘China Sunflower’ which features some searing solos and the aching vocals while there’s an explosive guitar break on ‘I Know You Rider’. The band hit their stride on 'The Other One’ with more spiralling and meandering solos. In fact this track is so good you can almost forgive The Dead’s characteristic dodgy harmonies on the following ‘Attics of My Life’. And finally it’s good to know the closing ‘Cold Rain and Snow’ is the old Bluegrass favourite rather than typical festival weather. In many respects this double release is back to front as The Grateful Dead audio is well worth exploring while you suspect the DVD portion would have been better served as a contextual back up to the Dead’s first UK appearance.